We just thought you'd like to know what it takes sometimes to keep a network of public radio stations on the air. Follow this link to the WEKU Facebook page for a complete photo album with more shots from a trip up Buffalo Mountain in Hazard, KY. to put WEKH (90.9 FM) back on the air. 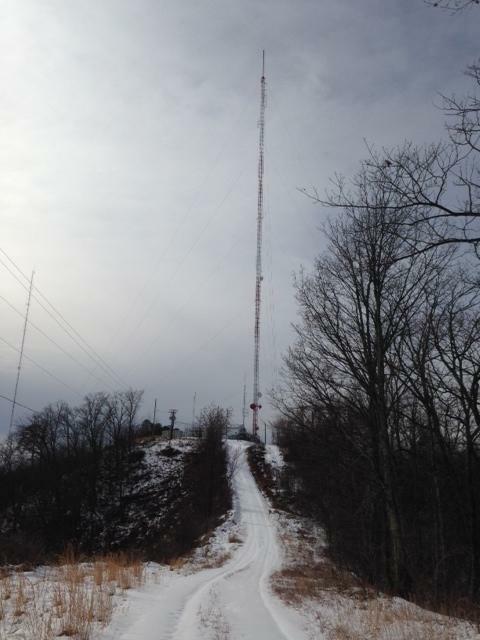 The tower from which WEKH (90.9 FM) transmits high atop Buffalo Mountain in Hazard, KY. The station went off Thursday morning from a power failure. After power was restored, the transmitter would still not come back on. Soooo....on Valentine's Day, engineer Phil Haye's made the trip up to the tower site at the top of the mountain. The last mile or so of the trip was, by necessity, on foot. Thanks, by the way, to the listeners who noticed and called, emailed or sent Facebook messages about the transmitter outage. And, thanks for your patience and understanding!